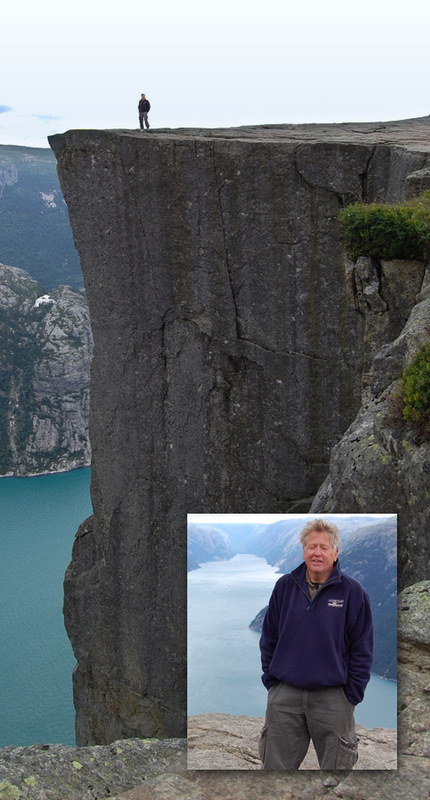 It’s a vertical drop of 2000 feet to the fjord below. And I hate heights! I create on-screen solutions for businesses that want to communicate messages with words and images. And I direct the technical element of conferences and events. My experience of producing visual communications includes video, animated presentations, and interactive programmes: made for screens from televisions, computers, and mobile devices, to huge LED arrays and projection screens at exhibitions and events. I have directed live events with a full panoply of players and technicians, media and AV gadgetry. I can work with you to do any or all of these things creatively, reliably, and economically. I have the skills and experience to manage and creatively direct projects, regardless of scale. But that’s not all. Businesses often need smaller productions, that don’t need a team of people to create them: for which, in fact, a team might be extravagant or counterproductive. For those situations I have a set of personal skills that have proved the equal of many creative specialists. I write and direct across all media, shoot and edit stills and video, and create presentations, linear or interactive, in several formats, including simple websites. See ‘NEXT‘ for more on how I can be cost-effective; and ‘WORK‘ to see a selection of the programmes I have made (though the ease of showing them does mean that video and TV productions predominate). I’ve explained exactly, and honestly, my contribution to each finished production. ‘PAST‘ offers a brief history of me: at least, the bits that are professionally relevant! It’s there to show my business background – which helps me understand corporate language and issues. ‘BLOG‘ is the section of the website where I post regular news, thoughts, and insights relevant to my work. I use the word ‘regular’ loosely, and confess that it doesn’t get updated as often as I’d like! To contact me, click ‘CALL‘.